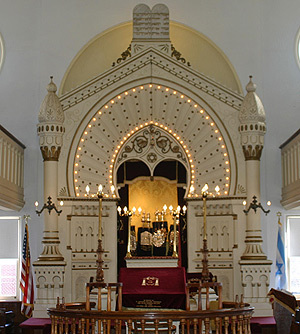 The Moorish Revival architecture of the B'nai Israel Synagogue of Baltimore dates back to the late 19th Century and therefore shows none of the modern synagogue architectural trends. It is constructed of brick, trimmed with Indiana stone and granite. The exterior front of the building features at its peak the traditional two tablets inscribed with the Ten Commandments topped by a Star of David. Just below, between the slanted lines of the roof are three circular windows framed and faced by cast concrete designs. 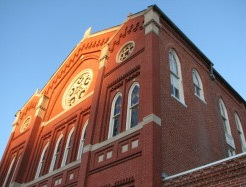 The large window in the center sits within a stone/brick arch reminiscent of Byzantine architecture. To the sides are set the smaller windows framed by false stone porticos extending from the roof to the ground. Behind these windows are the stained glass windows of the Sanctuary. The paired windows of the lower front wall have a unique shape and layout that reminds one of the distinct shape of the Mosaic tablets. The interior of the Sanctuary also resembles those of the synagogues of the Eastern Mediterranean lands with their Byzantine influence. The Beemah, where the Cantor leads the Service and the Torah reading takes place, is surrounded by seating on three sides. The magnificent hand carved ark is on a raised platform fronted with a rostrum for Rabbinical sermons and other speakers. The ark is surmounted by marble tablets of an ashy color, the first word of each of the Ten Commandments being inscribed on them in letters of gold. These tablets were a present from the Hebrew Hospitable Association. The wooden carvings of the ark are trimmed by golden paint at defining edges This beautiful wooden ark was handmade by a Mr. Yeager and took two years to complete. For this work Mr. Yeager received the grand sum of $77. Above the ark on either side are two circular (formerly) stained glass windows, the blue sections having been destroyed by vandals, have not been replaced as yet. The rear wall of the Sanctuary has at its upper levels three beautiful stained glass windows. At the center is a large circular window and at either side, some distance away are smaller circular windows. These are framed on the inside by mirror images of the cast concrete designs seen on the exterior of the building. The ceiling of the Sanctuary, in its original state, was painted a light shade of blue imprinted with a lovely painted design emulating the frescoes adorning European churches. A sample of these designs is still visible on the right side of the Beemah where the rehabilitating plaster coating was purposely omitted. The exterior walls of the Sanctuary and the lower edge of the Gallery still bear the original gas light fixtures. Electric lights were introduced in 1915 and added thereafter. A large, made to order chandelier was installed about 1889. This structure features both facing upward gas lights and facing downward electric lights. In keeping with Orthodox religious practice, men and women sit in separate areas. As was the custom in previous days the women sat in the second floor gallery, which has a low wall at its front, and the men of the Congregation occupied the main floor. Currently, when attendance is modest, the main floor is instead subdivided by a lattice work partition. The building houses a downstairs Chapel for conducting prayer services for small attendance events such as daily minions (no longer held except on Sundays and Secular holidays) and Minor Holidays. Exterior to this Chapel is a small area which formerly housed a Torah study area but is now used for the Social gathering which follows a prayer service. The original version of this area can be seen in the first production episode of the popular TV program Homicide: Life on the Streets. Thank you to Dr. Paul Miller and Quarterfield Dental Associates for sponsoring B'nai Israel's computer and technology operations.